Wait, so... there's a princess? Stuntmutt's observations can be shocking, sometimes. Stuntmutt had some of the same issues this week as you did. When I was a kid, I loved Marvel comics. I was always drawn to the ones that said 'Special Guest Star' on the cover, like when Spiderman would turn up in the Fantastic Four, or Thor would 'guest' alongside The Hulk. But Guest Star only ever put in an appearance for a couple of panels and was utterly inconsequential to the story. So I'd generally feel quite disappointed. I like to think I've managed to capture the true essence of that experience here. Stuntmutt's crossing the streams today. Happy Friday! 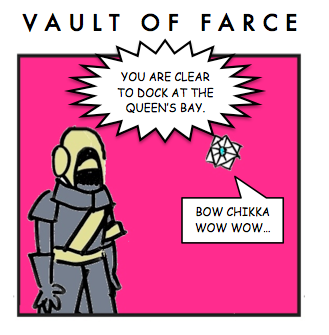 Stuntmutt thinks Bungie is funnier than he is (check today's Xur offerings), but he still served up a comic for you today. Must have resulted in a ton of codes. All of which had already been used by reddit forumgoers. This came in yesterday, but... well, here. Thanks, as always, to Stuntmutt. A thread started in our forum asked an interesting question regarding Oryx's motives in The Taken King. Stuntmutt delivers the answer eloquently. Stuntmutt dazzles with another Vault of Farce! Who's looking forward to the Trials of Osiris? Stuntmutt is! Yeah, Stuntmutt HAD to go there..
Stuntmutt turns an eye to the Cryptarch today - I'm getting flashbacks.